How urban areas expand, and how people are organized within them, will shape the path of economic growth and opportunity across the country. ECONorthwest has partnered with MapCraft.io to facilitate data-informed collaboration and strengthen urban policy. The MapCraft Labs App allows users to view and edit policy scenarios and quickly calculate outcomes. 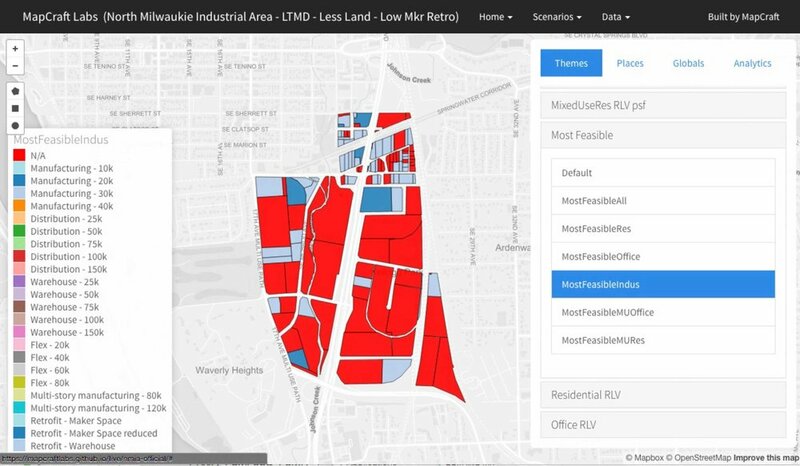 This first-of-its-kind app replaces countless Excel spreadsheets and GIS maps with an interactive tool that allows users to instantly compare hundreds of “what if” scenarios. The Labs App is ideal for integrating analytics into design-oriented planning processes that are often qualitative in nature, eliminating feedback cycles. Stakeholder engagement processes also benefit from its collaborative, multi-user environment. With support from our team of economists, this easy-to-use app walks clients through planning their project. To try out the Labs App, visit our demo page. The Labs App displays a map divided into color-coded locations. A side menu functions as a calculator, allowing users to modify construction costs, area medium income, etc. Based on these inputs, the locations on the map update in real time, delivering assessments of development feasibility and/or the magnitude of public funding opportunities. Growth in our nation’s major cities has strained transportation networks. Increases in the number of cars on the road and a general lack of revenue for maintenance and capital improvement projects has resulted in crumbling infrastructure and roadways choked with traffic. Increasingly, cities, regions, and states are turning to an economic-minded approach to help alleviate the problem: congestion pricing. ECONorthwest specializes in modeling and evaluating efficient pricing mechanisms for transportation facilities, including congestion pricing, value pricing, and high-occupancy toll lanes. Our tolling models can incorporate the project owner's business rules, such as maximum toll levels and minimum speeds, and can be optimized for travelers' benefits, revenue production, or level-of-service maintenance. With appropriate data, ECONorthwest’s Toll Optimization Model can perform planning- or investment-grade analyses. It simultaneously optimizes and solves for toll levels, volumes by vehicle class, revenues, and speeds, and reports out up to 150 related variables for each link of the modeled network. The model is especially useful in partial pricing applications, such as managed lane projects, but it also can be applied to full (all-lane) pricing and HOV project evaluation.